Born in the crazy atmosphere of South Florida, this 1st generation Cuban-American comedian has honed his craft into a freeing and inspired comedy experience. He is equally adept at traditional stand-up, improvisation, and his very own brand of original guitar comedy. During his twenties he won various contests including Latino Laugh Festival in 2000 and Winner of the Las Vegas Comedy Festival in 2003. He has featured on CBS' "Urban Latino" and Telemundo's MUN2, show "The Roof". He frequently visits New York City- a mecca for all artists. 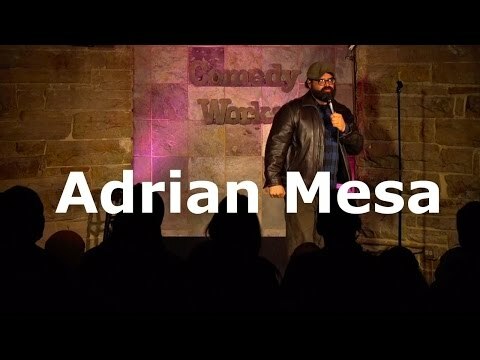 Aside from garnering props from pros at Caroline's Comedy Club,Gotham, or Stand-up New York, Adrian also has proven to be quite electric in the "alternative" rooms sprinkled throughout the Village and the outer boroughs. He also explored the great west, immersed himself into the Denver comedy scene-where original fresh comedy flows as freely as the hand-crafted micro brews. Adrian has performed for Comedy Central's South Beach Comedy Festival, and was invited to Montreal's Just for Laugh's Comedy Festival where he was part of "New Faces of 2010" which spotlights up and coming comics from around the world. In 2011, his voice talents for an animated short, Xemoland, was chosen as an official selection for The Sundance Film Festival.